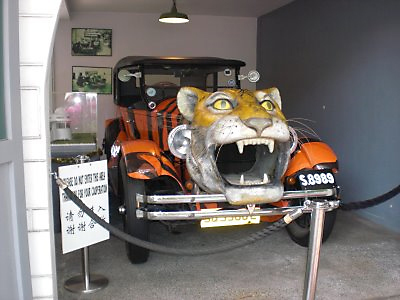 Incidentally, the photograph of the Tiger automobile with its stripes and tiger head reminded me of the racing rivalry between Aw Boon Haw and the flamboyant Sultan Ibrahima sportsman and hunter, and grandfather of the present sultan of Johorand of the egregious diplomatic incident when the sultan, enraged at being overtaken by Aw Boon Haw, shot at the Tiger car on Bukit Timah Road. It was considered lese-majesté to overtake royalty even on foreign roads. In Johor, it was verboten. Notwithstanding, the British colonial administration forbade the sultan thereafter from visiting Singapore ever again except for purpose of going to and from the Singapore airport, then at Kallang. Aw Cheng Hu (Emma), grandmother of the author, May Chu Harding, with Mrs. C.V. Devan Nair, wife of Singapore's third President. Devan Nair was kind enough to give Escape from Paradise a great review! “It took me two and a half evenings to complete your un-put-downable book...it is a unique contribution to the appreciation of a life in Singapore. Thank you for having written it.” C. V. Devan Nair, former President of Singapore. On September 4, 2010, at the age of 96, Emma died in Singapore. Here is an article about Aw Cheng Hu, "Auntie Emma." How Did They Really Get Their Start? Barely a decade after the brothers started to manufacture and sell Tiger Balm from their mother’s kitchen in Rangoon, they had already amassed a string of pharmaceutical companies stretching from Burma to Thailand, Malaysia, Singapore, the East Indies, Hong Kong and China. By the eve of the Sino-Japanese war in 1937, the Aw brothers had built a business empire with 10,000 workers toiling in the Tiger Balm factories. Just when everything was going so great, a squad of policemen showed up at the brothers’ house to serve them with an arrest warrant. Boon Par and Boon Haw were charged with illicit trafficking in opium, and counterfeiting. Aw Cheng Hu, known as "Emma"
Aw Cheng Hu, known as "Emma," was born in Rangoon, and brought to Singapore by her father, Aw Boon Par. Emma is May Chu's grandmother. My grandfather’s name was Lee Chee Shan, but I called him “Kong Kong,” Cantonese for grandfather. My grandmother, Emma, was “Mamak,” literally, “great mother.” Formally, my grandfather was known as Dato Lee Chee Shan, and my grandmother, Datin. Dato and Datin are Malaysian titles originally bestowed on tribal chiefs and their wives, but now reserved for the richespecially the Chinese rich. Of course, at the time, I knew nothing of such things. So much deference was shown to Kong Kong by Mamak, that you would never guess that she was the one with all the money. This did not mean that Mamak was subdued, or mousy. Not at all. While Kong Kong usually ate in silence, Mamak did all the talking. She was very animated, gesturing as she talked. She enjoyed herself and laughed easily. She was truly Boon Par’s daughter. Still, out of respect for her husband, Mamak always dressed as he wishedcolorfully, in traditional Chinese cheongsams, always with matching red lipstick and nail polish. Each cheongsam had its own matching set of jewelrynothing subdued ever, not even during the day. Mamak made Kong Kong very happy. Everybody made Kong Kong very happy, and even at the bank, all the ladies wore cheongsamsthey had to. 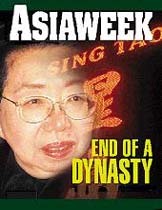 Sally Aw, the adopted daughter of Aw Boon Haw, inherited the Aw's newspaper empire at the age of 23. In 1988, she won the most prestigious American award for journalismthe Carr Van Anda Award from the University of Ohio, a distinction which is usually reserved for the most outstanding figures from the American media such as Walter Cronkite and Ted Turner. May Chu first met Sally Aw in Hong Kong. Did I look wrong, somehow? Not Chinese enough? Had I made a mistake by sitting down? Should I be kneeling? In 1999, Sally found herself deep in debt and verging on bankruptcy. She also faced a serious legal problem. There is a Chinese proverb that wealth in a family lasts for only three generations. Sally managed to make it in two. Tiger Balm (虎標萬金油)or Tiger Ban Kim Ewe or "Ten Thousand Golden Oil" is the trade name for a heat rub or ointment manufactured and distributed by Haw Par Healthcare in Singapore. It was originally developed in the 1870s by a herbalist, Aw Chu Kin, in Rangoon, Burma, who asked his sons Aw Boon Haw and Aw Boon Par on his deathbed to perfect the product. Oversea Chinese around the world will remember Tiger Balm, especially the old generations, this was the medical herbal oil that accompanied them from childhood to old age. Even the young generation of today is are familiar with Tiger Balm. Tiger Balm is available in several varieties, the weaker Tiger Balm White (which is recommended for use with headaches) and the stronger Tiger Balm Red (which is not to be used on the head). There is also another version called Tiger Balm Ultra. Aw Chu Kin (胡子钦, 原名胡诞钦) ? - 1908 in Rangoon, British Raj) was a Burmese Chinese herbalist. He is best known as the original inventor of Tiger Balm. Aw Chu Kin's father was a Chinese herbology practitioner in Xiamen and a Hakka from Zhongchuan, Yongding, Fujian Province, China (福建省永定下洋中川村客家人). Being of a poor background, Aw Chu Kin first immigrated to Singapore in 1863 where he stayed at the kongsi of his clan at Telok Ayer Street. He then moved to Penang and started to work as a practitioner of Traditional Chinese medicine, known as a sinseh (先生) in Penang Hokkien. Afterwards, he moved to Rangoon where, with the help of his uncle, founded his medical hall or medical shop, named Eng Aun Tong(永安堂药行)("The Hall of Eternal Peace") in 1870, located at 644,Canton Road (仰光广东街644号). Aw Chu Kin was married in Rangoon. He had three sons, the eldest of whom, Boon Leng (Gentle/Refined Dragon) died young. He was survived by his two sons, Boon Haw (Gentle/Refined Tiger) and Boon Par (Gentle/Refined Leopard). In 1892, Aw sent Boon Haw to his grandfather's village to be instructed in traditional Chinese methods while Boon Par stayed in Rangoon to receive a British education. In 1900, his two sons Aw Boon Haw, who had returned to Rangoon, and Aw Boon Par decided to manufacture and market the medicinal ointment under the name Eng Aun Tong, the name of the medical hall. In respect of the said balm, they adopted a trade mark consisting of the device of a tiger. The word "TIGER" is taken from the name of the elder brother Aw Boon Haw. "Haw" (虎) in Chinese means the animal tiger. The Chinese word "Par," the name of the Younger brother means the animal leopard. The trading name Eng Aun Tong was coined to denote the quality of the product from the popular medical hall in Rangoon. The trade mark TIGER and the device of a leaping tiger have been used in respect of the balm since 1900. When Aw Chu Kin died in 1908 at Rangoon,he left his medical hall, Eng Aun Tong, to his son, Aw Boon Par, having despaired of eldest son Boon Haw's rebel-rousing ways. The gentle leopard, finding the responsibility too much to bear, later asked for his older brother's return from China to carry on the family business in Rangoon. Aw Boon Par (胡文豹); born 1888 in Rangoon, died 1944 in Rangoon, was a Burmese Chinese entrepreneur and philanthropist best known for introducing Tiger Balm. He was educated in English school in Rangoon, Burma. He was the lesser known, and a quiet leopard, compared to his brother, Aw Boon Haw. Boon Par was the son of Hakka herbalist Aw Chu Kin, who upon his death in 1908, left the business to Boon Par. Boon Par then called his elder brother, Aw Boon Haw, to help run their father's apothecary Eng Aun Tong ("The Hall of Eternal Peace") together. "I will learn all I can about Western medicine, you can prescribe Chinese medicine," Boon Par said to his brother. "Together we won't lose a single patient. He can choose between east and west and the fee will stay with us." To perfect and exploit their late father's recipe, the sons took over their mother's kitchen. Boon Par, the quiet leopard, toiled whilst Boon Haw, the gregarious tiger organised. Together they produced Ban Kim Ewe, Ten Thousand Golden Oil, panacea for all ills. 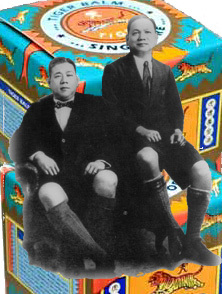 In 1918, Aw Boon Haw co-developed Tiger Balm as a trade mark, with his younger brother Aw Boon Par. Through artful packages and clever marketing, with the brand name of Tiger Balm (虎標萬金油) or Tiger Ban Kim Ewe or "Ten Thousand Golden Oil" is the trade name. The brothers later made their versatile balm a household standard, first in their native Rangoon, then Singapore, Malaysia, Hong Kong, China, and the rest of Southeast Asia. Just when everything was going so great in Rangoon, a squad of policemen showed up at the brothers’ house to serve them with an arrest warrant. Boon Par and Boon Haw were charged with illicit trafficking in opium, and counterfeiting. The British Chief Inspector of Police, Cyril Taylor, put the brothers under house arrest. But the police were not able to pin anything on the brothers. Still, this was humiliating to the brothers, Boon Haw decided to leave Burma and move the business to Singapore. Although Aw Boon Par wished to stay in Rangoon, it was because in addition to his two official wives (Piah Lan, Daw Saw who remained in Rangoon), he had a secret wife, Hong Yin, in Rangoon. Nevertheless, Boon Haw who had settled in Singapore in 1926 convinced him to immigrate, move the family business and found the precursor of today's Haw Par Corporation. By 1926, the headquarters of Eng Aun Tong "House of Eternal Peace" had been transferred to Singapore. A new and larger factory was built at 89 Neil Road where production was ten times greater than that of Rangoon's. The factory building, a 3-storey neo-classical building, is still standing prominently at the corner of Neil Road and Craig Road - it was built by Aw Boon Haw in 1924. Boon Par took up a residence at Tanglin Road in Singapore. The house eventually become known as the "Jade House." Boon Par later moved to larger mansion at 178, Pasir Panjang Road. The Aw brothers launched Sin Chew Jit Poh - their first paper - in Singapore in 1929; mainly to advertise their tiger series of products. In 1932, a Limited Company was incorporated in Singapore, know as Haw Par Brothers (Pvt.) Ltd (“虎药有限公司”). It took over the business of the two Aw brothers including their assets, such as trade marks. From Singapore, the company continued to carry on business and export Tiger Balm to various countries, including India, until the Japanese occupation of Burma and Singapore during World War II. The company devised various trade markets to be used in various countries, the essential features of each of which was the device of a leaping Tiger, the word "Tiger Balm" written in English and also in Chinese characters. These trade marks were registered in different countries all over the world. Aw Boon Haw bought land in 1935 to build a villa that would be a unique and fitting residence for his beloved brother, Aw Boon Par. He commissioned Ho Kwong Yew, a brilliant young architect, to design a house that would complement the gardens which were to feature thousands of statues and tableaux depicting Chinese myths and legends and which were to become well known all over the world as the Tiger Balm Gardens. The villa was originally called "Tiger Balm Gardens". A new mansion, Haw Par Villa, was built on a hill in Pasir Panjang surrounded by unique gardens depicting Chinese mythology for the younger, quieter Boon Par in 1937. Haw Par Villa was opened in March 1937 and many guests were invited to the grand reception hosted by Aw Boon Par, the lord of the manor. By the eve of the Sino-Japanese war in 1937, the Aw brothers had built a business empire with 10,000 workers toiling in their Tiger Balm factories. Aw Boon Par lived in Haw Par Villa only a few years before the second world war broke out in 1939. The Japanese occupation of Singapore in World War II occurred between 1942 and 1945 after the fall of Singapore on 15 February 1942. Military forces of the Empire of Japan occupied Singapore after defeating the combined Australian, British, Indian and Malayan garrison in the Battle of Singapore. The occupation was to become a major turning point in the history of several nations, including that of Japan, Britain and the then colonial state of Singapore. Singapore was renamed Syonan-to (昭南島 Shonan-to), which means "Island of the Light of the South" or "Southern Island (obtained) during Showa period". During the Japanese occupation of Singapore, Aw Boon Haw moved to Hong Kong to manage the business from there, while Aw Boon Par stayed in Singapore to run the factory. In 1942, Boon Par was forced to close the Singapore factory and flee with his family to Rangoon, which was also occupied by Japanese. The Allies drove out the Japanese from Singapore in April 1945, but unfortunately Aw Boon Par died in Sept 1944, prior to the victory. 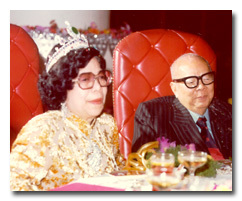 Daughters: Cheng Sim or Suri Santipongchai, married to Lee Aik Sim(李森, Lee Santipongchai), who in 1971 was given Sing Sian Yit Pao to manage. The newspaper is now managed by their children Netra and Winn. This may be the only company set up by Aw Boon Haw which is still in the hands of the family ; Cheng Hu (Emma), married to banker Lee Chee Shan(李志城,1909-86) who became the President of the family owned Chung Khiaw Bank. The bank was subsequently merged into Haw Par Brothers International Ltd (by then a public company) which was taken over over by the predator firm Slater Walker Securities to whom Aw Cheng Chye sold his shares. Aw migrated to Singapore in 1926, where he began the business of Tiger Red Balm with his brother, Aw Boon Par. Aw also founded several newspapers, including Sin Chew Jit Poh (星洲日報) on 15-1-1929 in Singapore, Sin Ping Jit Poh(星槟日报), now known as Guang Ming Daily (光明日報) was founded in 1939. Both of these newspapers are now based in Malaysia. A third Aw brothers newspaper, Sing Tao Daily (星島日報), dates back to 1-8-1938 and is currently based in Hong Kong. A fourth newspapaer, Sin Siam Jit Poh (星暹日报), was founded in 1951 in Bangkok, Thailand. Aw Boon Haw moved to Hong Kong during the Japanese occupation of Singapore and managed the businesses from there, while his brother stayed in Singapore until he closed down the factory and went to Rangoon. Aw returned to Singapore after the end of World War II and re-established his business. While on a trip to Hong Kong from Boston in 1954, Aw died at the age of 72 from a heart attack following a major operation. His legacy is found in the Haw Par Villas throughout Asia, with locations in Singapore, Hong Kong, and the Fujian Province. 1908: Taking over the business from the late father, together with brother Aw Boon Par. 1926 : He moved his head office to Singapore after the British conducted an unsuccessful opium raid in his house. He opened the Eng Aun Tong Medical Hall in Singapore. Turnover of his company reached $10 million. 1929 : Founded Sin Chew Jit Poh, a Chinese newspaper competing with Tan Kah Kee's Nanyang Siang Pau. To further promote his Tiger products he also published the Tiger Standard. 1935: Built Haw Par Villa in Hong Kong for his 2nd wife, Kyi Kyi. 1937 : Built Haw Par Villa otherwise known as the Tiger Balm Gardens for his brother, Boon Par. The gardens depict Chinese mythology. 1938 : An OBE conferred on him for his philanthropic contributions. 1950 : Set up the Chung Khiaw Bank. He placed the management of the bank under the leadership of his son-in-law, Lee Chee Shan, also a Burmese Chinese who arrived in Singapore in 1929. 1954 : He died in Honolulu in Sept 1954 at the age of 72 years old, half-way home after a stomach operation in America. His empire was divided among six of his nine surviving children and four nephews. Sally Aw taking control of what is now the Sing Tao group (centered in Hong Kong with Sing Tao) and cousins forming Haw Par Brothers (centred in Singapore and including titles such as Sin Chew Jit Poh, which later experienced difficulty in competition with that nation's two dominant players). 1961 Aw Boon Haw's will provided all estates in Hong Kong to be given to Tan Kyi Kyi and Sally Aw. The other children of Aw Boon Haw and Aw Boon Par were not happy and demanded for the return of Haw Par Villa and Eng Aun Tong(永安堂) to be equally shared by the next of kin. There was a legal battle between Tan Kyi Kyi and Sally Aw on one side, and, on the other, the other children and nephew of Aw Boon Haw for the estate of Aw Boon Haw. Sally Aw applied for liquidation of Haw Par Brothers Ltd. The outcome of the legal battle was that the Eng Aun Tong and Har Par Villa was owned by Haw Par Brothers Private Ltd.
1969 Sally Aw launches daily editions of Sing Tao for diaspora Chinese. 1969 Haw Par Brothers Private Ltd was listed as Haw Par Corporation Limited in the Singapore Exchange on 16-8-1969. 1971 Slater Walker Securities gains control of Haw Par Brothers International Ltd (inc Chung Khiaw Bank and newspapers such as Sin Chew Jit Poh, Hong Kong Eng Aun Tong). It was sold by Aw Cheng Chye(胡清才), son of the Aw Boon Par, when he cashes out by selling all his shares. 1971 Union Overseas Bank (UOB) acquires 53% of Chung Khiaw from Slater Walker. The Haw Par Deal was later reported irregular by the Singapore government. On 22-8-1971, Aw Cheng Chye reportedly committed suicide in Santiago, Chile. Some said he died of stroke, but some said it was the curse of Aw Boon Haw. Father: Aw Chi Kim(胡子钦), a herbalist from Zhongchuan, YongDing, Fujian Province in China. Brothers: Aw Boon Leong(文龙) ("gentle dragon") died early; Aw Boon Par(文豹) ("gentle leopard"). Wives: Boon Haw had four wives. First wife, Tay Piang Hong(郑炳凤, 郑氏是广东惠阳客籍人,生长于仰光? ); his second wife, Tan Kyi Kyi(陈金枝), he built a special home at Tai Hang Road, Hong Kong for her. Third wife (黄玉谢) was from Penang,and fourth wife (邱秀英). Adpted Sons: Dato Aw Kow(胡蛟), wife Tan Kah Joo, became General Manager(社长) of the Sin Chew Jit Poh in 1941, the Singapore Tiger Standard and the Chung Khiaw Bank; Aw San(胡山), who became general manager of the Eng Aun Tong Medical Hall and its Canton factory; Aw Hoe(胡好),1919-1951, became general manager of the Medical Hall and managing director of the Tiger Standard and the Sin Chew Jit Poh. He died tragically in a plane crash in North Malaysia in 1951. A Standard-owned Dakota airplane crash-landed in Thailand, killing everyone on board, including Aw Hoe. He was only 32 years old. Aw Boon Haw was very sad when Aw Hoe died so oung. Aw Kow and Aw San were the adopted sons of Tay Piang Hong, the first wife. Aw San was disliked by Aw Boon Haw and did not get any inheritance from the father. Aw Hoe and Sally Aw are the adopted children of the 2nd wife, Tan Kyi Kyi, the two children were the most capable. Sons: The 3rd wife(黄玉谢) has two sons It Haw(胡一虎), Er Haw(胡二虎) who passed away during WW2. The forth wife(邱秀英) give birth to two sons one daughter, Aw Sin(胡星),Aw San Haw(胡三虎)who passed away during World War II. Aw Si Haw (胡四虎). Aw It Haw(胡一虎) and Aw Si Haw (胡四虎) were still young when their father passed away. Aw It Haw (胡一虎) and his Japanese wife (胡晓子) however open a Japanese supermarket in Singapore. Adopted Daughters: Sally Aw Sian (胡仙), who was a Hong Kong businesswoman and former Chinese People's Political Consultative Conference member, and a renowned Hong Kong newspaper publisher but had to sell of much of the family's fortunes to avoid bankruptcy. In 1931, Aw Boon Haw and the second wife Tan Kyi Kyi, adopted the five-year-old daughter of a distant relative from Burma, changing the girl's name from She Moi to Sian. Aw Sian inherited her late adopted father's assets. Aw Sian and Aw Hoe are the adopted children of Aw Boon Haw's second wife, Tan Kyi Kyi, and their most favorable children. Daughter: Aw Sin(胡星), the daughter of 邱秀英. Haw Par Villa is located at 15, Tai Hang Road, Tai Hang, Hong Kong Island, SAR. Built by Aw Boon Haw in 1935 this garden was one of the main attractions of Hong Kong. However, in 1998 the ownership inheritor sold the whole complex to a land development company Most of the Garden has been sold to be redeveloped into a residential area. In 1998, the owner and inheritor, Aw Sian sold the whole Garden complex to a land development company, Cheung Kong. The Hong Kong Government reached an agreement with the company for the Hong Kong Antiquities and Monuments Office to preserve and restore the Haw Par Mansion and its private garden when the Garden complex is redeveloped. Located along the Pasir Panjang road, Singapore's Haw Par Villa is actually a theme park depicting stories from the Chinese mythology. The great entrepreneur Aw Boon Haw built it in the year 1937 for his loving brother Boon Par, thus the name Haw Par Villa came into being. Haw Par Villa, the quintessential place depicting Chinese folklore is a great tourist attraction of Singapore. There is another Haw Par Villa in Fujian, China.